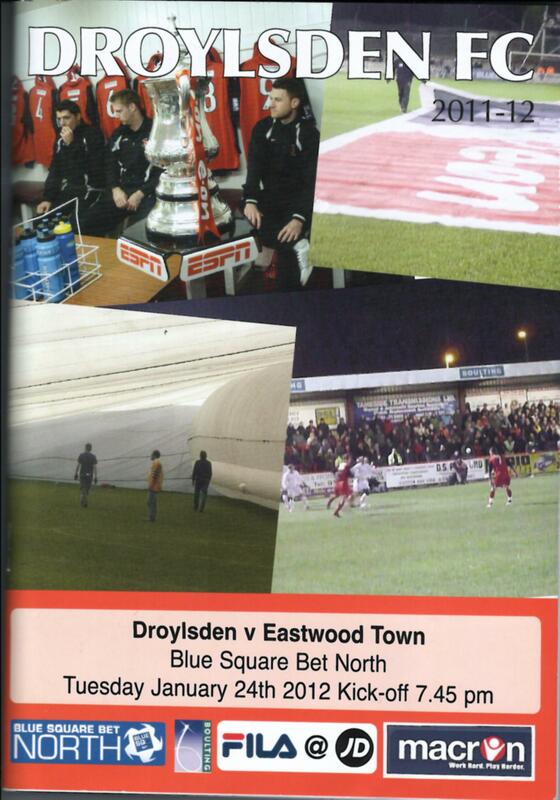 Droylsden FC was one of the few remaining sub 40 milers I had left. 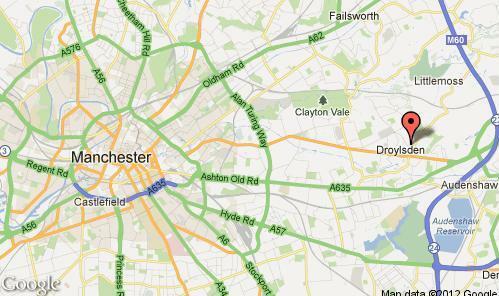 Afterwards I wished I’d taken the 40 plus miles route of the M6 and M60, as the direct route was excruciating. It may not have been tortuous but it sure was torturous. The A6 through Hazel Grove and Stockport must be the slowest and most irritating road in the UK. The number of traffic lights was extraordinary and made the already slow traffic more stop-start than a Scalextric game between a couple of trigger happy five year olds. All within the backdrop of 30mph limits and speed cameras every few hundred yards. However far it is by motorway, it has to be better. 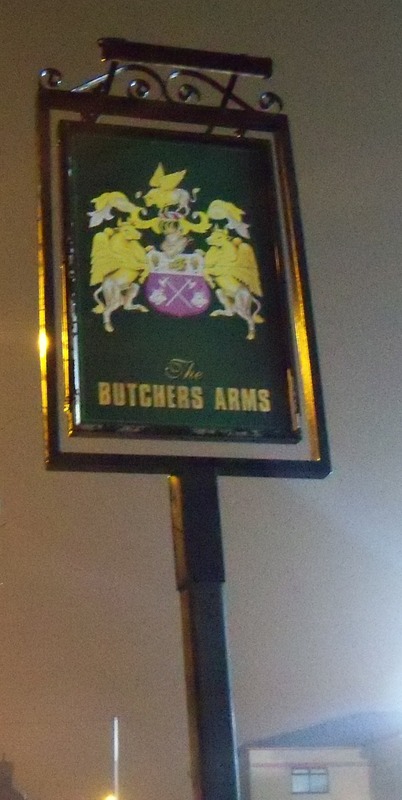 I arrived at the Butcher’s Arms in bad time and stressed out, my jaws hurting from having gnawed on the steering wheel for the last half hour. Droylsden were founded in 1892 by Joseph Cropper, the landlord of the Butcher’s Arms, and played behind the pub – and still do. The only vestige of the pub left being the sign. The ground is known affectionately as The Slaughterhouse or The Abbatoir and the club’s nickname is The Bloods. A real pea-souper had descended on East Manchester for the game, lending a eerie atmosphere to The Butcher’s Arms, especially with only 175 spectators in the ground. Droylsden had ambitions for the play-offs and so were expecting an easy three points tonight against a side way adrift in the relegation zone. I’d seen Eastwood Town a month back at their own ground where they were fairly hapless losers; 3-0 to fellow strugglers Workington Town. The game turned out to be the best neutral game I’d seen all season, by quite a distance. 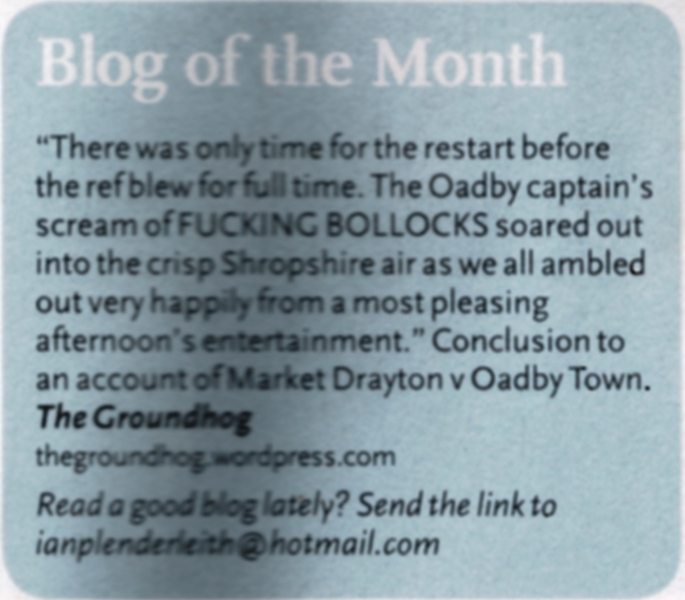 I can’t convey how one sided the game was and how inevitable a Droyslden victory was for the first hour of the game. They should have been 4-0 by the break, but had to be content with just the one, from Johnson, after 31 minutes. After another 31 minutes Johnson doubled the lead and gave Droylsden the points, no question about it. Any in-game betting would refuse to take bets on a draw or away win. Eastwood had until that moment barely got out of their own half, let alone had a shot or even some kind of attack. The Badgers had been baited. Then the unthinkable happened. A rare foray into the Droylsden half on the right, that given the game so far, looked as unnatural as ball lightning, ended with a low cross into the box for Burge to tap in. 63 minutes gone but a consolation surely. Three minutes later a free kick was awarded just inside the Droylsden half. A chip into the centre of the area was cleared to the left…to be picked up and crossed back in for Haggerty to scramble in. 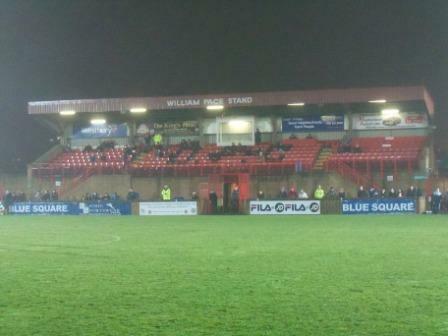 2-2 and utter disbelief from the home fans. Worse was to come. 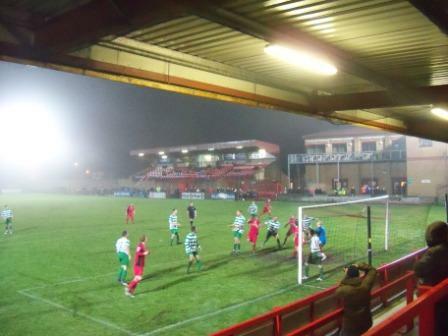 A free kick in a similar position to the equaliser was deftly flicked in over the top of the penalty area. It missed everybody but Haggerty, on the right, who let it drop onto his right foot, perfectly weighted, to slide under the keeper and in to the net. A quality strike to complete the best smash and grab raid I’d ever seen, by miles. However, as must happen in these circumstances, given the relative league positions of the teams, and according to the universal unwritten rules of football, Droyslden would end up equalising. It was an inevitable fate that no magic on earth could prevent. Only those who truly know football, understand this. Sub headings to the laws, that are less written in stone, merely strong guidelines, say that the equaliser should come in the last minute and preferably be a soft goal. The guidelines were adhered to as a massive scramble ended up with Gardener at the near post who slotted in under the keeper, who should’ve stopped it. He was powerless to the fates, though. The ground has lots of olde-worlde charm, as you’d expect from a ground that’s lived in three different centuries. 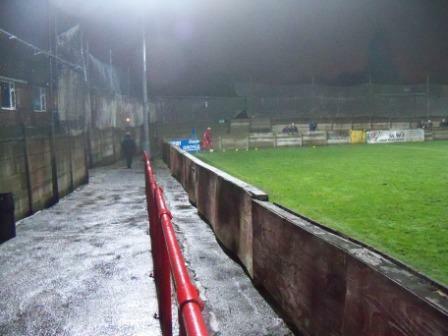 It was renovated in 1952 and the pitch re-oriented, but it’s been the home of Droylsden since their inception 120 years ago. A high main stand sits next to a large clubhouse, adorned at the front with a very tempting high balcony. The opposite side is a terrace, with the middle third covered; the crumbly brick, thick paint on rust crush barriers type. A more modern covered terrace sits behind the goal next to the clubhouse with an open terrace behind the other. Sometimes the ground has to take the plaudits in the event of a bad game but tonight it was the game itself that made the trip worthwhile, despite The Butcher’s Arms being a great ground in the old style that I like. This entry was posted in Groundhopping, Non-League, Travelog and tagged Conference North, droylsden afc, Eastwood Town, Non-League, the butcher's arms. Bookmark the permalink. Ha Ha great memories from this game myself David. Great post, well written. Like the Scalextric gag. Pea souper, indeed! Thanks for the comment once again. Nice to know my attempts at humour are not completely lost in the ether!